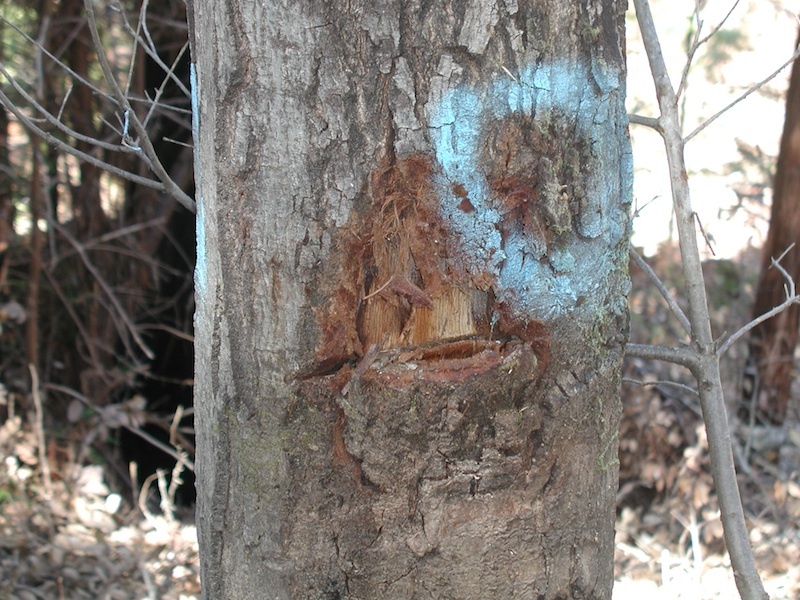 Hack-and-squirt is an herbicide treatment used primarily to kill hardwood trees. Imazapyr, the chemical that is injected into the tree during the process, is by far the most heavily used chemical in Mendocino County’s logged forestlands, which cover the majority of the county’s western half. Hack-and-squirt is promoted by Mendocino Redwood Company (MRC) as the most efficient and economic method of eliminating “unmarketable” trees on the immense scale they operate on. While other companies also use the practice, MRC is the largest entity that utilizes hack-and-squirt in Mendocino County. Imazapyr is non-selective, meaning it doesn’t discriminate between which plants it kills that it comes into contact with, but is mainly used by logging companies to eliminate Tan Oak (Lithocarpus densiflorus), Pacific Madrone (Arbutus menziesii), and other hardwoods. MRC claims that in order to restore the ecosystem from previous companies’ destructive logging practices, they must remove the “over-abundance” of Tan Oaks to promote the growth of the coniferous species of Redwood (Sequoia sempervirens) and Douglas Fir (Pseudotsuga menziesii). MRC’s forest restoration methods conveniently fit in with their own companies’ maximization of profit— they are unable to mass commercialize Tan Oak in the current forest products market, so they favor the production of Redwood and Doug Fir on the lands they operate. Just like every other large Timber corporation, MRC relies on a system of production which favors the species that feeds their bottom line. But the sustainability image the company flouts comes at the cost of total habitat collapse and the poisoning of entire ecosystems. Imazapyr is applied to the inner wood of the tree: literally the tree is hacked with an axe, the bark is peeled back, and the chemical is inserted into the meristem region (where active growth takes place), killing the tree from the inside out. Within a few hours after an application, synthesis of DNA (genetic material) and cell division stops because the chemical inhibits the first enzyme used when plants synthesize branched chain amino acids. An organism as large as a tan oak tree can take up to a month to die after being injected with the herbicide, starting in the roots. Because Imazapyr is also water soluble, it travels through soil and can be taken up into the root systems of other plants, winding up in streams and contaminating entire regions. An ancient native of the Pacific Northwest that plays a vital ecological and cultural role in the bioregion, tan oaks are regarded as invasive by MRC, a gross negligence to the fact that the quick re-sprouting of tan oaks after being cut or burned supports the resuscitation of whole ecosystems and that their quickly established interwoven network of roots reduce erosion after disturbances like logging. Many species, including band-tailed pigeon, deer, elk, and bear, depend on the large, oil-rich nuts for fattening up for the winter. The acorn woodpeckers, squirrels, and chipmunks store the acorns in caches for food year-round. “For millennia, tan-oaks produced regional Native people’s staff of life. Mature tanoaks generate a prodigious amount of acorns. Old-growth trees can produce 300-500 pounds of this traditional staple food item every year. They are more pest-resistant and thus easier to store than other varieties. Coastal Pomo groups managed the landscape to enhance the growth and vitality of the trees through controlled burning and by coppicing and fumigating the trees. MRC claims that in order to bring the forest “back into balance” with the “correct” ratio of conifers to hardwoods (correct in that it fits into their business model of selling the lumber of Redwood and Douglas Fir), they must eliminate Tan Oaks, which they see as taking sun, water and space from commercial species. They have done this primarily through hack-and-squirt, killing more than 14 million trees since purchasing land holdings from Louisiana Pacific Lumber in the 1990’s. Because the company now owns roughly 227,000 acres, or 10% of the private land in the county, making it so almost everyone in western Mendocino County shares a watershed with MRC, what they do in the forest affects everyone. Using an average of 5,500 pounds of the herbicide Imazapyr every year to eradicate Tan Oaks, and roughly 616 gallons of Glyphosate (Roundup) and Triclopyr (Garlon) in broadcast spray to kill underbrush, MRC’s herbicide addiction has dire consequences for the health of all those who call this place home. It can cause plant damage at levels too low to be detected by standard testing. Those who irrigate food crops or use ground water supplies may thus be impacted by persistent presence of Imazapyr in the environment. When the chemical is exposed to light, it transforms into quinolinic acid which is irritating to the eyes, the respiratory system, and the skin. It is also a known neurotoxin that can cause nerve lesions and symptoms similar to Huntington’s disease, a neurodegenerative disorder that affects muscle coordination and leads to cognitive decline and psychiatric problems. In a 1997 study published by the journal Weed Research, RW McDowell and others found that heavy rainfall causes significant transport of Imazapyr, which binds to sediment particles that prevent it from degrading as quickly. The chemical readily desorbs, meaning it readily disperses downstream when carried by said sediment. Because of such adverse health effects and public outcry, the European Union banned it in 2003. In the US, however, there has been far too little research done on this chemical that is so widely used in our forests and has such blatantly catastrophic effects on the land.